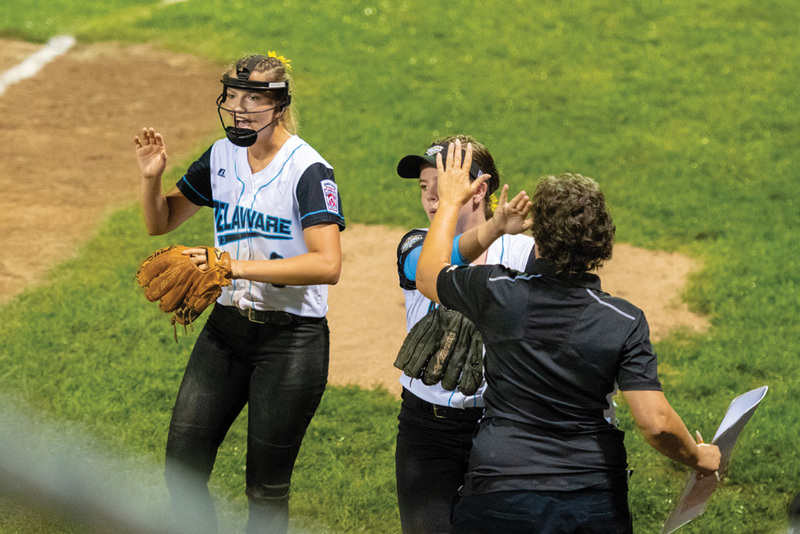 District 3’s Taylor Wroten and Jordan DiFava give high-fives after Wroten struck out another East batter during Game 1 of the Senior League Softball World Series on Monday night. It was an exciting first two-plus days of Little League Senior League Softball World Series action at the Pyle Complex early this week, as players, their coaches and fans from 10 different teams from all over the world descended upon lower Sussex County for a week of softball action — all vying for the coveted World Series championship. Defending champion Georgetown — once again the host team from District 3 — got itself off to a good start, winning its first two games of pool play. As of Coastal Point press time on Wednesday, they were one of three teams still remaining undefeated. Through play on Wednesday, pitcher Taylor Wroten has been stellar in the circle for Georgetown, helping the locals to a 12-0 win and 2-1 (13 innings) win over the East and Southwest, respectively, in their first two games. She allowed just one unearned run on 12 hits over her 19 innings, with 19 strikeouts, to just two walks. At the plate, Georgetown had hit .358 as a team, while scoring 14 runs in their first two games. Kylie Kruger (.625), Rylie Elliott (.500) and Kelsey Kormanik (.444) led the way for the locals. Elliott had knocked in three runs and scored another three. Sierra Livingston and Wroten had each plated two, while Wroten, Jordan DiFava and Siera Jones had scored a pair of runs each. Through the 10 games, West had scored the most runs in two games, with 21, while East had scored the least, with just one. Four teams had yet to win a game. There were four pool play games set for Wednesday, and six more on Thursday, before bracket play begins on Friday. Games begin on Friday at 5:30 p.m., then, on Saturday, games will start at 4 p.m. The third-place game will be played on Sunday at 11 a.m., before the championship game at 2 p.m.
For game highlights and results, check out the Coastal Point sports news Facebook page.